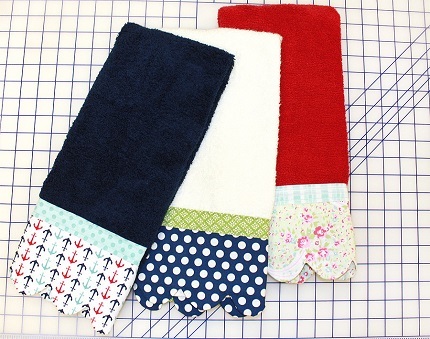 You can make these scallop edge towels out of a plain hand towel and a quarter yard each of two coordinating quilting cottons. Fat Quarter Shop has a tutorial showing how, including a pattern for cutting the scallop panel. They’d be pretty in a bathroom or a kitchen. Go to Fat Quarter Shop’s blog to get the pattern and the tutorial.